Kempston Rovers earned an FA Cup second qualifying round home tie against Burgess Hill Town after beating Harefield United 3-2 at the weekend. The Walnut Boys will host their Ryman Premier Division opponents on Saturday, September 17 with the two sides paired together in Monday afternoon’s draw. 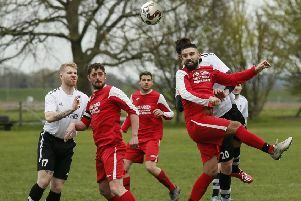 In their game against the Hares at Hillgrounds, Kempston had shouts for an early penalty turned down, before moving 1-0 ahead on 16 minutes when skipper Tom Guiney headed home. They then led 2-0 three minutes later as great build up play saw Michael Lyon square for Jamaine Ivy to slot home from close range. Harefield threatened from range, home keeper Martin Conway parrying, but after the break they did pull one back on the hour mark through Frank Altomare after a goalmouth scramble. Rovers immediately restored their two-goal lead though as Dom Marsala’s cross was turned home by Ieuan Riley. With the game becoming end to end, Harefield were back in the tie once more as Altomare netted with 18 minutes to go. Harefield almost ensured a replay in the closing stages when a free kick was brilliantly saved by Conway. Rovers travel to Histon this weekend. Kempston: Conway, Guiney, Herbert, Goodman (Johnson 66), Stoyles (Simpson 74), Macrae (Riley 59), Shepherd, Ivy, Lyon, Fuller.